Hello! I hope you're ready for some silliness. This is what we blog about in the winter :-) If you would like to read about how the Traveling Tote series began, read about it HERE, and HERE is the first post. And if you want to travel along with us, you can grab yourself a tote HERE! Our next traveling tote post is on March 1st and we have a great giveaway to offer so mark your calendar. Behind the scenes with my traveling tote, my hubby is great sport. Joe and I were in New Orleans in September and went on a tour of Mardi Gras World where they create the floats for Mardi Gras. Speaking of which, have you been to Mardi Gras? I would love to know if you have been. 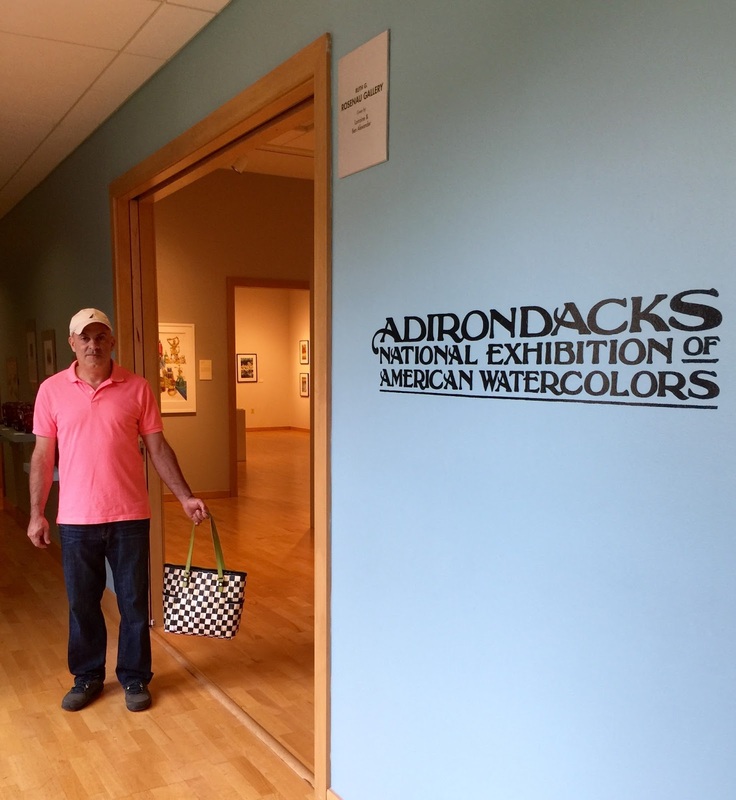 In October we attended the Adirondacks National Exhibition of American Watercolors. I found this picture on my camera! Joe sneaks and takes pictures of my tote bags and it makes me chuckle when I see what he's been up to. Here we are in our favorite city.....New York City. In December, we visited MacKenzie-Childs in New York City. "My mother told me that I was born during a snowstorm on January 26, and they had a difficult time getting to the hospital. We lived in the Bronx until I was three years old and then we moved to Manhattan. I started college to become an environmental engineer but lost interest in the program shortly after starting it. I took an aptitude test which showed a strong interest in becoming a shop teacher. After I completed college, I decided to join the Peace Corps and found myself overseas with my job changing several times. I decided to return to the states and worked at cabinet shops. It wasn't long before I landed a job to utilize my degree in industrial arts education (shop teacher) or what's known as technology education today. My mother said I was her only child (out of seven) that used their degree for employment." Here's Joe with his Stormy Kromer cap on. If you're not familiar with the hat, George Kromer wanted a piece of outdoor gear that worked as hard as he did. Mr. Kromer had his wife stitch together the first cap by hand, and they are still making them today. The cap has a pull-down earband to keep your ears warm if you should need it. I love those hats, they have serial numbers that you register and they even make them in Xavier's size whose first birthday is coming up in March. Take a peek and meet a few of the "other men behind the totes". Patti with Miss Kenzie and Miss Taylor @ "Pandora's Box"
Debbie, MC should be sponsoring you with that wonderful link you provided and also with your great use of their products. I love your entry table and the valance I see beyond in that last photo. Looking forward to our party in March! LOVE this!!! What a cool dude 😎!!! You got a good one! PS Love the table in your foyer and the sweet photo. You and Joe are such soul mates, Debbie! I hope that Joe had a great birthday, and he sure is such a good sport. I always love seeing his happy smile and how cute he looks in his Stormy Kromer cap. Happy Birthday to a fellow garlic grower. Debbie..he is a wonderful sport..never looks impatient..just one of those kind kind faces..lucky students..you..the children and now grandchild..
nice is SOOOO important isn't it? I keep telling you that Joe needs his own bag!! He is certainly a good sport - Great photos of the places you visited this past year. Happy Travels! Thanks for sharing and thank you to Joe for playing along.